Signed lr: "W. T. Trego"
According to a letter sent by Anthony C. Schmidt to the current owner in February 1980, the painting originally had a very old label on the back of the frame which identified it as "The Bugle Call." Remains of this label, with the penciled inscription: "The Bugal [sic] Call/Artist William T. Tre..." can still be seen on one stretcher. A New York Times article of January 1884 suggests that the work may have been owned by Thomas B. Clarke, though it is not on the checklist provided by H. Barbara Weinberg in her “Thomas B. Clarke: Foremost Patron of American Art from 1872 to 1899,” (American Art Journal 8, no. 1 [May 1976], pp. 52–83). Further confusion is provided by the fact that the painting was being offered for sale at an exhibit in Louisville, KY, later that same year. This is an unusual work in that the title suggests a military subject and at first glance there appears to be none. However, there appears to be an encampment in the background with glimpses of white tents seen beyond the trees. 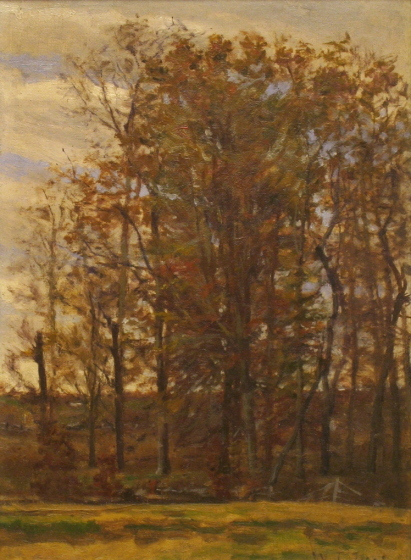 The woodland scene anticipates many of the genre works Trego would do in his later years. Purchased by the current owner in February 1980 from Anthony C. Schmidt, a dealer in fine art objects in Collingswood, New Jersey. Louisville, Kentucky, August 16–October 25, 1884: Louisville Industrial Exposition. Charles M. Kurtz, Illustrated Catalogue of Works of Art in the Art Building of the Southern Exposition at Louisville, Ky. August 16–October 25, 1884 (John P. Morton and Company, 1884) It Appears in this exhibition catalog as entry 98, offered for sale at seventy-five dollars.